The Uber crash has the industry examining self-driving tech's shortcomings. 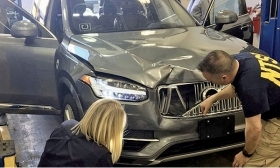 In the wake of Uber's fatal self-driving car crash in Tempe, Arizona, suppliers of core autonomous technology are struggling to address a cloud of doubt surrounding sensors and software that might have seemed ready for public introduction. The range and refresh rate of lidar sensors, which can create gaps in the images the laser captures.